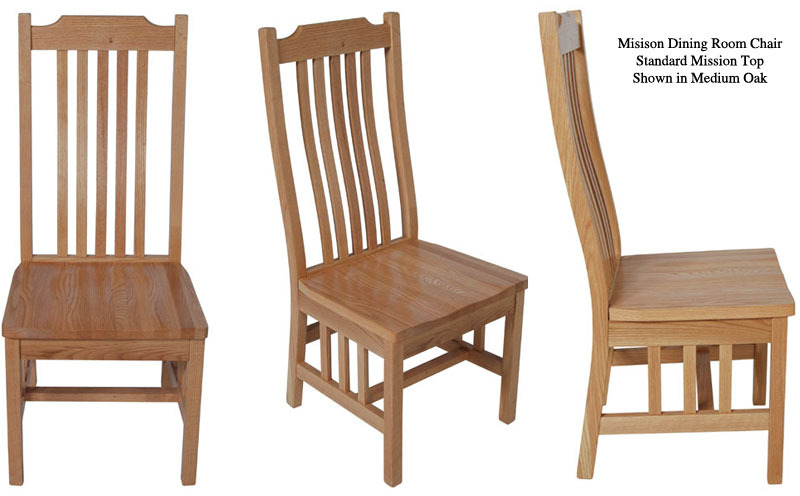 Our mission chairs are created from solid hardwood, and are designed to last. Each chair is handcrafted individually by an Amish craftsman. Please scroll down the page for more details on the mission dining room chair. If you're unsure about the finish for your chair, we encourage you to order wood samples. Color accuracy on our website cannot be assured due to a number of variables including lighting, the camera used, and the settings on your computer monitor. 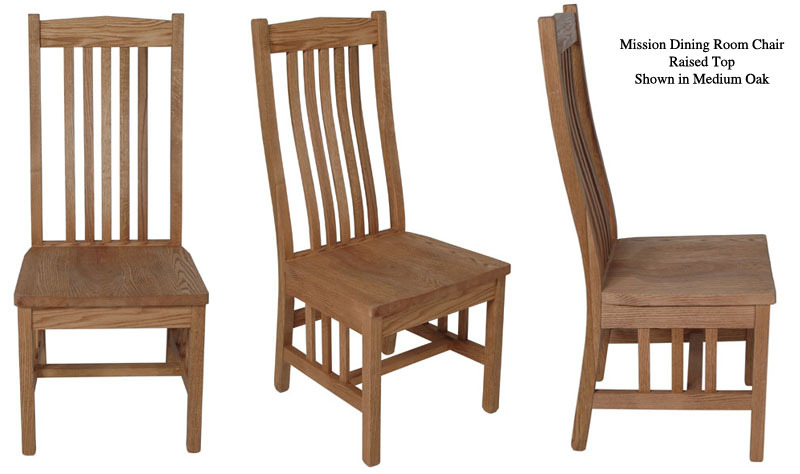 Our standard chairs are created from solid hardwood, and are contoured for comfort. 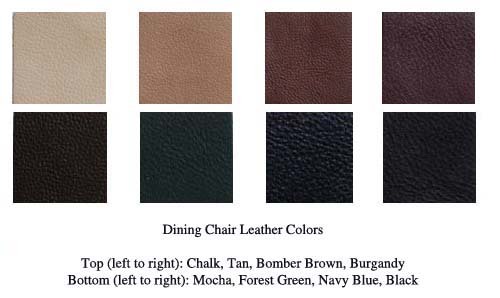 We also have leather seats available, which replace the standard wooden seat. The standard seat design is square on the corners -- a square and rounded design are both available. You can see photos of both leather seat designs here. You can see a swatch of eight available colors here. There are three tops available on our Mission Chairs. Please note that these names (Arched, Standard and Raised) are not descriptive of the actual chair top style, but are based on names used by the craftsman. This same choice is also available on our mission barstools. Standard Mission: click here for a photo. Arched Mission: click here for a photo. Raised Mission: click here for a photo. Our standard chair skirt is solid wood, without ornamentation. Fluting is a more complicated wood design that adds detail to the chair, the fluting is added to the area just underneath the seat. 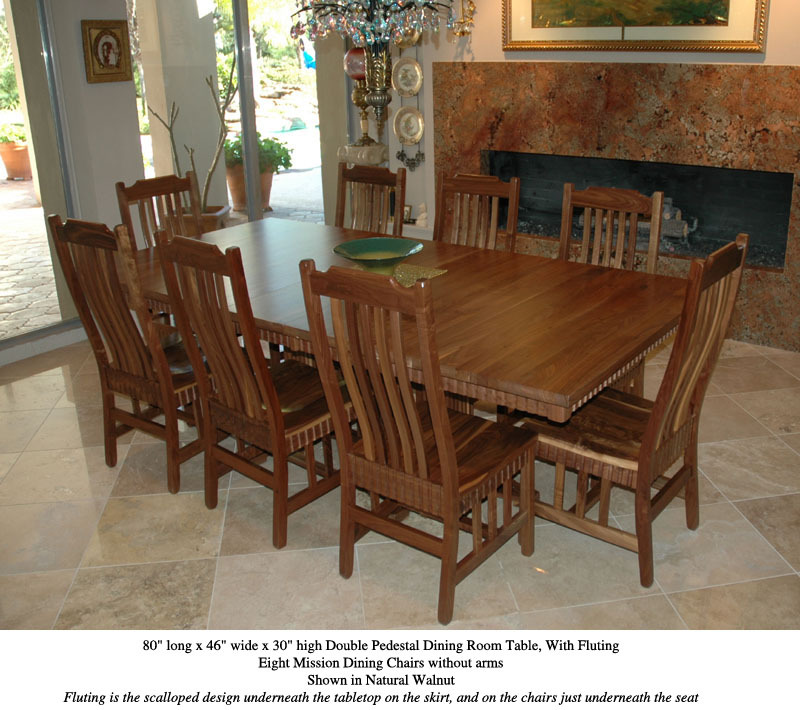 Please click here for a photo of fluting on a set of walnut chairs. We can also create custom sized chairs for your family, common changes include raising or lowering the seat by an inch. We can create benches, barstools, chairs without arms, and other options that are not on our website currently -- so long as they're in the same style as existing furniture. In other words, we can create items like an eastern style barstool or a zen style bench with leather seat and back. Please contact us for a custom quote. To see additional photos of our mission dining room chairs and barstools, see our Flickr photo gallery. Clicking on this link will open a new browser window. 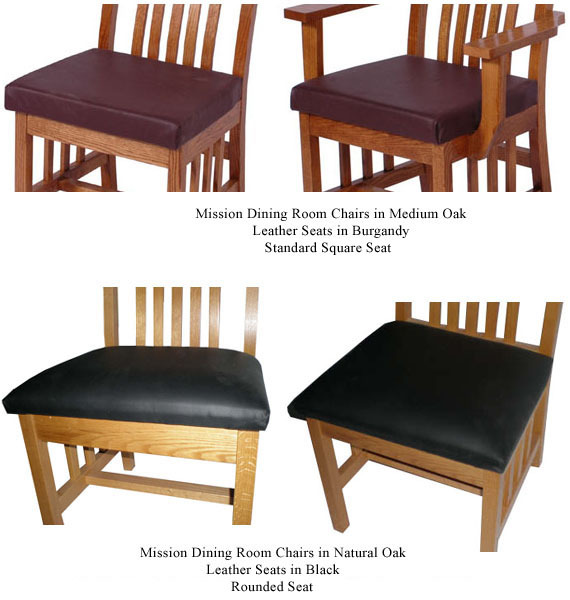 Our mission dining room chairs measures 42" from the floor to the top of the chair, and 17" from the floor to the seat. The seat measures 18" wide by 16" deep. Chairs with arms extend out beyond this base. The mission barstool measures 41" from the floor to the top of the chair, the seat is 18.5" wide x 17.5" long, the seat is 24" high. 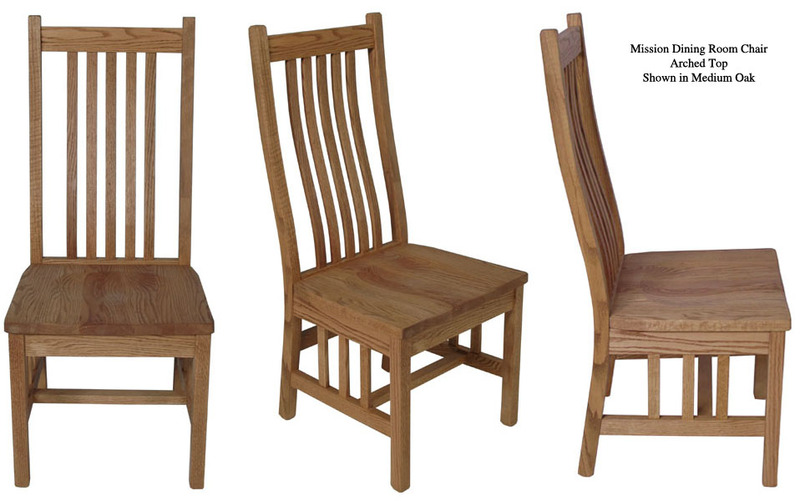 Genuine Solid Hardwood: Our mission dining room chairs are created from solid hardwood. We use only genuine hardwoods -- there is no pine, plywood filler, pressed wood, "select hardwoods" or veneers used in our mission chairs. Repair: If the dining chair is dinged, scratched or gouged via accident then your chair can be sanded and refinished. This is the benefit of solid hardwood. Our dining chairs are very solidly constructed and are intended to be a living part of your home and family, to be handed down from one generation to the next for many years to come. Each dining room chair is created by hand by Amish master craftsmen and is carefully inspected individually prior to shipping to assure its quality. To assure this quality, we offer a full money back guarantee and a full one year warranty against defects on our dining room chairs.